Posted under Parents' Articles. Updated 30 April 2018. If your child has a spinal deformity you probably have questions and concerns. The health care providers and nurses in the Boston Children’s Hospital Spine Program have prepared this guide to help answer your questions. In it we describe spinal deformities and explain both non-operative and surgical treatment. Your child’s orthopedic surgeon and nurse will answer your questions and help you understand your child’s specific spinal abnormality and treatment. This guide is not meant to substitute discussions with your child’s health care provider or nurse. No question is too simple to ask. After reading this guide, please write down any additional questions you have and bring them with you to your child’s next appointment. The spine is made up of many individual bones called vertebrae, joined together by muscles and ligaments. Flat, soft intervertebral discs separate and cushion each vertebra from the next. Because the vertebrae are separate, the spine is flexible and can bend. Together the vertebrae, discs, muscles, and ligaments make up the vertebral column or spine. Different regions of the spine are named differently. The cervical spine refers to the neck, the thoracic spine to the chest, and the lumbar and sacral spines to the lower back. Just as the shapes of peoples’ bodies differ, the normal spine varies in size and shape. You may have been told to “stand up straight,” but no one’s spine is perfectly straight. The healthy spine has front-to-back curves (normal cervical lordosis, thoracic kyphosis, and lumbar lordosis). It’s only when these curves become too large that they present a potential problem. When the backward curve in the upper spine is too great, the condition is called thoracic hyper-kyphosis, round back, Scheuermann’s disease, or sometimes simply kyphosis. When there is not enough backward curve in the upper spine, the condition is called hypo-kyphosis. When the inward curve in the lower back is too great, the condition is called hyper-lordosis or swayback. Although the spine does curve from front to back it should not curve sideways very much. A side-to-side curve is called scoliosis and may take the shape of an “S” (double curve) or a long “C” (single curve). Scoliosis is more than just a curve to the side. The scoliotic spine is also rotated or twisted, like the stripes on a barber pole. As the spine twists it pulls the ribs along with it, so that one side of the chest becomes higher than the other, or the shape of the breastbone may change. You may have noticed that one of your child’s shoulders is higher than the other or that his/her clothes hang unevenly at the waist because one hip is higher than the other. To better understand this, compare the drawings of the normal spine and the scoliotic spine. Many people with scoliosis also have hypo-kyphosis. Because of all the possible combinations of curvatures, scoliosis can be very different in different people. There are many different causes of abnormal spinal curves. Some babies are born with spinal defects that cause the spine to grow unevenly, a condition called congenital scoliosis or congenital kyphosis. Some children have nerve or muscle diseases, injuries or other illnesses that cause spinal deformities, for example cerebral palsy, or myelomeningocele. Sometimes, however, the back just doesn’t grow as straight as it should, and no one knows why. This most common type of scoliosis is called “idiopathic” scoliosis and has no known cause and no known prevention. This means that if you have scoliosis, nothing you did caused it, and you could have done nothing to prevent it. Scientists are studying idiopathic scoliosis, hoping to discover its cause. They have many clues but no real answers yet. They do know it tends to run in families and that girls are five to eight times more likely to have it than boys. Scoliosis isn’t rare; about 3 out of every 100 people have it. Many people have mild scoliosis but are unaware of it and need no treatment for it. Idiopathic scoliosis doesn’t happen all at once; it develops gradually over time, and may worsen rapidly during rapid growth in the pre-teen and teen years. Some mild curves never worsen with growth and need no treatment. Some curves worsen only a little and need no treatment. Early detection of abnormal spinal curves by school screening programs and pediatricians is intended to find scoliosis early enough to begin brace treatment and avoid surgery. Once an abnormal spine curve has been detected, it’s important to monitor the curve during growth. The years before and during adolescence are a time of rapid growth and your child’s curve can worsen quickly. Your child’s health care provider will decide on his/her treatment plan and follow-up based upon the results of x-rays and a physical exam. Even though your child’s curve may not bother him/her now, it may need to be monitored. Your child’s health care provider will show you the curve on your child’s x-rays to help you understand how the curvature is measured. Avoiding future problems: Scoliosis rarely is a problem to the child or adolescent who has a curve. Why then do we bother to monitor and treat curves? Adults with moderate or severe scoliosis can have progressively worsening curves which cause cosmetic disfigurement, back pain and in the worst cases, difficulty breathing. Treatment after the curve has already become severe in adulthood is much less successful than treatment during childhood or adolescence. By finding progressive curves early, we hope to keep them from becoming problematic in adulthood. The treatment of scoliosis depends on the location and degree (severity) of curvature. Slight curves (curves measuring less than 20 degrees), usually require no treatment, but must be watched carefully for worsening during growth. If your child’s curve shows significant worsening or is between 25 and 40 degrees, and/or he/she is still growing, your child’s health care provider will probably recommend a bracing program. The scoliosis brace is designed especially for your child and his/her particular curve. It holds the spine in a straighter position while your child is growing to try to partly correct the curve or prevent it from increasing. A bracing program may help avoid surgery. Your child may need to wear his/her brace almost all the time while he/she is still growing. If your child has a milder curve or less growth remaining your child may only need to wear the brace part time or at night. Almost all braces can be hidden beneath normal clothing, and your child can continue to do all athletic activities. Usually there are other adolescents in your child’s school who wear braces, but since their brace isn’t visible, your child wouldn’t be aware! Since a bracing protocol can be difficult to adjust to at first, requiring help with organizing your child’s school day, the health care team will also assist with this aspect of care. The team offers both support and experience in guiding your child through the process. The team includes your child’s health care provider, orthotist (a specialist who makes braces), a physical therapist, and a nurse. The health care provider and the orthotist decide which brace design is right for your child. The braces are made of firm plastic and fit closely over the hips, and are worn under clothes. A few have metal pieces extending to the chin, but these are usually only necessary to treat hyperkyphosis and are usually worn part time. The physical therapist will evaluate your child’s posture, muscle strength and flexibility and will provide a home exercise program which is designed specifically for your child. This program helps to stretch and strengthen your child’s muscles so the brace is comfortable. Each time your child visits the clinic, he/she will see the physical therapist. A nurse will help answer any questions that you and your child may have. They will teach your child how to care for themselves and their brace, give you a schedule to follow, and help you and your child plan his/her day-to-day activities. If your child is interested they may be able to introduce your child to others who wear braces. Following a brace program may sound like a lot of work and effort, but if your child’s curve can be controlled with a brace and he/she can avoid surgery, it will be worth it! Some curves do not respond to bracing despite everyone’s best efforts, and some curves are just too large to begin with (greater than 45-50 degrees). If your child has this type of curve, he/she may need surgery. If your child’s health care provider recommends surgery, you’ll want to think about it seriously and ask many questions. The goal of the surgery is a usually a solid fusion (stabilization) of the curved part of the spine. A fusion is achieved by operating on the spine, adding bone chips and allowing the vertebral bones and bone chips to slowly heal together to form a solid mass of bone called a fusion. The bone chips (bone graft) may come from a bone bank or your hip (iliac crest). Usually, the spine is substantially straightened with metal rods and hooks, wires or screws(instrumentation). The rods hold the spine in place until your child’s fusion has a chance to heal. Once the fusion has healed (usually 3 to 12 months) the abnormal section of the spine cannot curve more. The rods, hooks or wires are usually left in your child’s back without causing any problems. Surgery varies greatly depending upon the amount of spine fused and your child may or may not experience a noticeable loss of spinal motion. Your child’s health care provider can tell you what activities he/she can do after a spinal fusion. Most sports are possible after a spinal fusion. 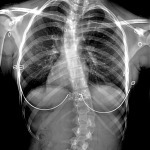 Posterior Fusion: Posterior fusion with instrumentation is the most common operation done for idiopathic scoliosis. In the posterior fusion the spine is operated on from behind with an incision straight down the back. Various types of rods, hooks, wires or screws are used to partially straighten the spine and hold it fast while the bone fusion occurs. For most of these operations on idiopathic scoliosis, no brace or cast is used postoperatively. In some congenital scoliosis or spondylolisthesis the posterior fusion may be done without instrumentation, and a brace is needed postoperatively. Anterior Fusion: In the anterior fusion, the spine is operated on from the front, or side. Anterior fusion is used in some special instances of idiopathic scoliosis when a lot of growth remains, and commonly in congenital scoliosis, kyphosis, or myelomeningocele. An incision is made along a rib and/or down the front of the abdomen to obtain access to the front of the spine. Bone graft from the hip, rib or bone bank is used for the fusion. Screws and washers attached to a rod may be used to straighten the spine. Fusions of this type may require a postoperative brace. Some anterior fusions can be done with minimal incisions and an instrument called a thoracoscope. Rather than needing a large incision, the surgeon can operate through smaller incisions with a telescope and camera. Anterior and Posterior Fusion: Some special cases of spinal deformity require both an anterior (front) and posterior (back) operation. Usually these can be done on the same day, but sometimes must be done at separate operations. Growing Rods: MAGEC™ (MAGnetic Expansion Control) or VEPTR™ (vertical expandable prosthetic titanium rib). Sometimes stabilization of a curved spine is needed at an age too young to be fused. In very young patients, rods can be attached to the spine (growing rods) or ribs (VEPTR) and periodically lengthened to keep up with spinal growth. Rod lengthening can be done with a small day surgery procedure or sometimes just using a magnetically driven rod (MagEC) without surgery. At an older age, a spinal fusion can be done. Below you’ll find a glossary of terms related to scoliosis and spinal deformities. This guide was prepared by the Boston Children’s Hospital Orthopedic Surgical Foundation for use by the Spine Program and adapted by the Center for Young Women’s Health. ©1993 Children’s Orthopaedic Surgical Foundation. Bone Age: An X-ray of the left hand and wrist is compared to the average appearance of the bones at different ages. An estimate of remaining growth is obtained. Bone Bank Bone: Specially processed bone graft obtained from cadavers. Bone Graft: Pieces of bone used to create a fusion, obtained from the patient’s iliac crest, rib, or from the bone bank. Boston Brace: A type of spinal orthosis (brace) developed at Boston Children’s Hospital. The Boston Brace System starts with prefabricated, symmetric spinal orthotic modules of different sizes. Individual braces are customized to fit a particular patient’s body shape and spinal curvature. The brace or orthosis is designed according to a ‘brace blueprint’ drawn from the spinal X-ray. The Boston Bracing System is commonly used throughout the United States and Europe. Brace: A semi-rigid plastic (and sometimes metal and leather) device which pushes on the muscles and ribs adjacent to the spinal column. The brace (also called an orthosis) is designed to lessen the abnormal spinal curvature while worn. Charleston brace: A brace used just for sleeping, the Charleston brace tries to over-correct the curve to compensate for not wearing the brace during the day. Cheneau brace: A rigid plastic TLSO brace emphasizing asymmetric pressure on the scoliosis curves. Disc: The intervertebral disc is a strong, rubbery and gelatin – like structure which normally separates the individual vertebral bodies and allows movement between them. Discs are usually removed from the portion of the spine undergoing anterior fusion and replaced with bone chips to create a fusion. Fusion: A continuous mass of bone which solidifies and immobilizes the desired part of the spine. A fusion is created by adding bone graft to the surfaces of vertebra and then immobilizing that part of the spine with instrumentation or with a cast. A solid fusion cannot bend or curve more as time passes. Harrington Rod: Designed by Dr. Harrington, the Harrington rod was the first modern means of spinal instrumentation which reliably produced correction and immobilization. It is no longer used, as more modern systems are better. Hook: A hook is that portion of the spinal instrumentation which grasps the vertebra. Incision: The cut made through the skin for the purposes of operation. Instrumentation: The metal rods, hooks, screws, etc. which are attached to the spine to change spinal shape and immobilize the spine while fusion occurs. ISIS, Quantec, or Ortelius: A computerized system used to document the three-dimensional contour of the spine using light beams and a scanning device. Inclinometer or Scoliometer: A simple device using a level to measure the ‘rib hump’. Useful for detecting and screening of scoliosis. Kyphosis: Curvature of the spine with the convexity pointing toward the back. It is normal to have some kyphosis in the thoracic (chest area) spinal column. Sometimes there is too much kyphosis in the thoracic spine, called “hyperkyphosis,” Scheurmann’s kyphosis, or “round back.” When there is not enough kyphosis in the thoracic spine (as is usually the case with idiopathic scoliosis), it is called thoracic hypokyphosis. Lordosis: Curvature of the spine with the convexity toward the front. It is normal to have lordosis in the cervical (neck) and lumbar (waist area) portions of the spine. Luqué Rods, Wires: Named for Dr. Luqué, these spinal rods use sublaminar wires (wires looped around the back part or each vertebra) for attachment. Luqué type instrumentation is commonly used in paralytic scoliosis such as that seen in cerebral palsy. Milwaukee Brace: The Milwaukee Brace was the first modern spinal orthosis used for scoliosis, and in its modified form, is still used for Scheurmann’s kyphosis and some spinal curves. Posterior Fusion: A fusion performed on the posterior or back surface of the spine. Rib Hump: The prominence formed by ribs on the convexity of a curve, caused by rotation of the spine and attached ribs. Risser Sign: The top of the pelvis bone matures in predictable stages referred to as Risser stages. These give some indication of growth remaining in the spine. Skeletal Maturity: When the bones (and spine) are finished growing, skeletal maturity has been reached. Spinal Column: The spinal column is composed of individual vertebral bones, ligaments, and discs. It surrounds the spinal cord. Spinal Cord: The spinal cord travels through the spinal column and consists of nerves which carry and receive signals to and from the arms, legs, and many internal organs. Spinal Rods: Spinal rods have been continuously updated since the introduction of the Harrington rod. Modern systems can be titanium or stainless steel and use hooks, pedicle screws, or sublaminar wires for attachment to the back of the spine (posterior rods). Many different systems with different names and brands arepopular because they offer more strength of fixation, more points of attachment to the spine and can help preserve or restore normal spinal contours of thoracic kyphosis and lumbar lordosis. SpineCor Brace: A brace made of flexible strapping material designed to untwist the scoliosis. Sublaminar Wires: See Luque’s Instrumentation. SSEP and MEP (Somato-sensory evoked potentials and motor-evoked potentials): A technique used to monitor spinal cord function during spinal surgery. Electrical signals are passed between the arms and the brain. TLSO (Thoraco-Lumbar-Sacral-Orthosis): A brace or spinal orthosis which does not extend above the shoulders. Vertebra: Individual bones which comprise the spinal column. Vertebral Body: The front portion of the individual vertebra.